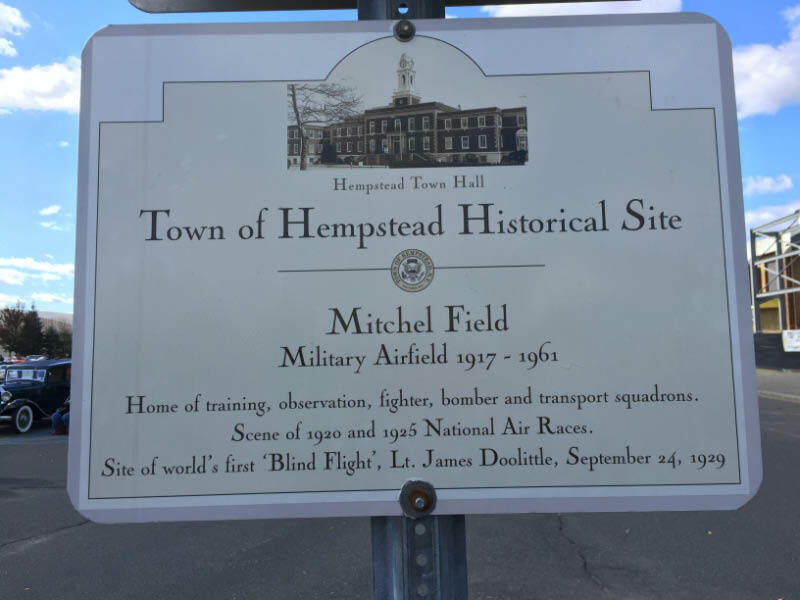 In addition to Mitchel Field, aerials will document the Roosevelt Fields (the airport and shopping mall), the two Roosevelt Raceways and remnants of the Long Island Motor Parkway. Villlages featured include Carle Place, Mineola, Garden City, East Garden City, Westbury and my boyhood hometown of East Meadow. 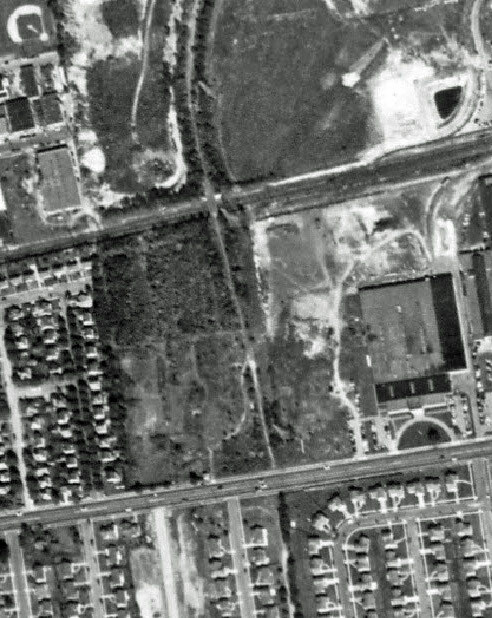 Leading off in the series is this November 1956 aerial. Old Country Road can be seen going east/west across the top and Hempstead Turnpike (part of the 1904 Vanderbilt Cup Race course) was the road going east/west below Mitchel Field. Thanks again Joel and Josh for this exciting new VanderbiltCupRaces.com series! The still active Mitchel Field Air Force Base. 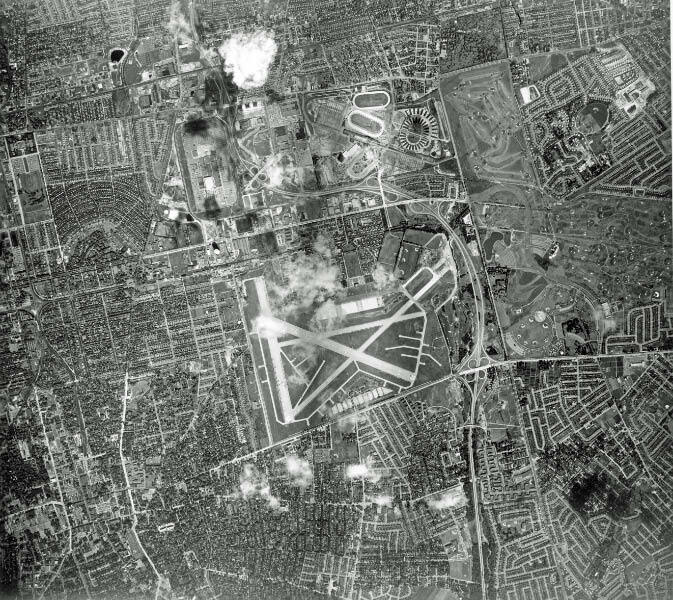 The air base was closed in 1961 as a result of the surrounding growing suburban developments. The baseball fields of Salisbury Park can be seen on the right- the site of my game-winning East Meadow Little League base hit! Airplanes parked at Mitchel Field. Can anyone identify them? This aerial documented the extension of Runway 23. I always wondered the purpose of the branches of the Mitchel Field runways. The answer: More parking spaces for airplanes. The Mitchel Gardens development that provided housing for military families. A historical marker near the Cradle of Aviation. The newly built Roosevelt Field outdoor shopping mall that was located on the site of the eastern section of the former Roosevelt Field Airport. The mall, which was later enclosed, opened on August 22, 1956. 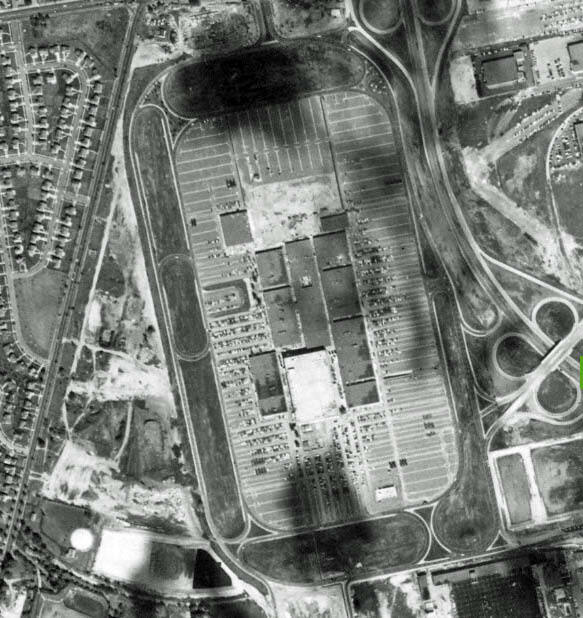 Remnants of the two Roosevelt Field concrete runways were still visible east of Meadowbrook State Parkway. The absence of traffic on the parkway confirms that this section had not yet opened. The active Roosevelt Raceway seen here was used for harness racing. It used the same grandstands that were built for the 1936 and 1937 Vanderbilt Cup Races. The new Roosevelt Raceway can be seen under construction. It opened for the 1957 harness racing season. The Long Island Motor Parkway in Mineola and Carles Place runs down the middle of this closeup. The Mineola LIRR Motor Parkway Bridge was still intact, while the Old Country Road Motor Parkway Bridge had been filled in. 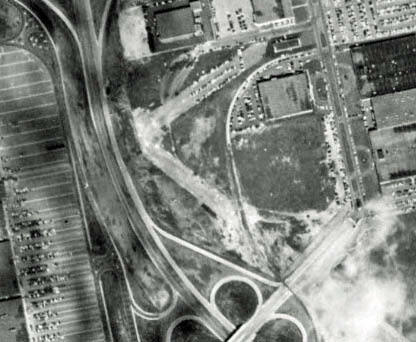 The site of the Meadow Brook Lodge and "keyhole-shaped" entrance to the lodge from Merrick Avenue were still visible in 1956. Remnants of the Motor Parkway can be seen going Salisbury Park during the time when Dwight Eisenhower was president. This section of the Motor Parkway was part of the courses for the 1908, 1909, and 1910 Vanderbilt Cup Races. The park would be renamed Eisenhower Park in 1969. I still remember the array of trees which bordered the original extension of Stewart Avenue. This was my East Meadow family home on Hemlock Avenue! Look very closely, I am waving at another low flying airplane! Can you spot any other notable roads and buildings in this remarkable aerial? Whoa! This aerial is so crisp it’s like reading a map, only much more informative. I was thinking Mitchel’s runway branches could’ve also served as emergency deployment ramps during the war conflicts. I’ve been to the museum a few times while supervising class trips but gotta go back at my own pace. Great info Howard, the most interesting part of these photos is the fact that all the homes, streets are so similar to today , 60 years later. oF course there has been infill in the two airports but your highways, recreation areas, the LIRR and the street grid is exactly the same as it was on the day of the photo.